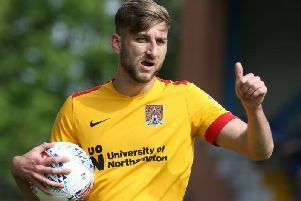 Crewe manager David Artell clashed with Cobblers striker Kevin van Veen after November's fixture at the PTS..
Outs and doubts: Crewe: James Jones (ankle). Cobblers: George Cox (ankle), Shay Facey (thigh). Possible line-ups: Crewe (4-3-3): Garratt; Ng, Ray, Nolan, Pickering; Ainley, Green, Wintle; Bowery, Porter, Kirk. Northampton (4-4-2): Cornell; Goode, Taylor, Pierre, Buchanan; J Powell, Turnbull, O’Toole, Bridge; A Williams, Hoskins. Man in the middle: Lee Collins - took charge of last month’s 1-1 draw with Morecambe and also oversaw Town’s 3-1 home defeat against Cheltenham Town earlier in the season. The Surrey official has handed out 52 yellows and just one red in 17 matches this season. Opposition view: “Northampton are a big, physical side and Keith knows what it takes,” said Crewe boss Dave Artell. “He knows the league and we know it won’t be easy. Four unbeaten and 12 points clear of the drop, Curle’s men now have an excellent opportunity to finally make the leap from the bottom third in League Two into the middle third. James Heneghan’s preview: With safety as good as secured, the Cobblers can start to shift their focus from this season to next over the upcoming 12 games and Saturday’s opponents Crewe Alexandra are one team in their sights. Whilst there’s nothing tangible for Town to play for, a positive end to the season aligned with a top-half finish would do wonders for morale and confidence heading into the summer when a rebuild is expected. And a top-half finish is not as unlikely as it may appear at first glance. The Cobblers are four points adrift of the team directly above them, Newport County, but then the next five clubs – Crewe being one – are separated by just two points. With a favourable fixture list remaining, including all of the current bottom four, three of them at home, there’s no reason why Keith Curle’s men can’t make a late bid to finish top half, even top 10, something which has appeared unlikely ever since the first ball was kicked back in August. Crewe’s dismal display during their defeat at the PTS back in November was of a team seemingly destined for a season-long battle against the drop. Beaten by a goal either side of half-time, from Andy Williams and Daniel Powell, Dave Artell’s men remain among the meekest opposition the Cobblers have faced, and the Crewe boss sounded a man under pressure when launching a remarkable outburst at referee Scott Oldham in his post-match interview. “He was disgraceful today, disgraceful,” ranted Artell, who played 11 games for the Cobblers in 2012/13. “He missed a clear elbow in the last second, it’s just disgraceful and he’ll get a zero from me. Crewe’s defeat at Sixfields formed part of a dreadful run across November and December when they lost eight of 10 games in all competitions, leaving them below the Cobblers in League Two and dropping ever-closer to the relegation zone. But the Alex recovered impressively after Christmas. They had only lost once in 10 games up until last weekend’s 2-1 home defeat to high-flying Exeter City, an impressive sequence of results that included notable wins over Lincoln, MK Dons, Carlisle and Colchester. So they are not a side to be taken lightly but the Cobblers too look a team on the up, particularly away from home with victory over Stevenage last time out coming off decent results at Tranmere and Lincoln. Four unbeaten and 12 points clear of the drop, Curle’s men now have an excellent opportunity to finally make the leap from the bottom third in League Two into the middle third. Town’s cause is helped by the return of several key men. Marvin Sordell, Jordan Turnbull and Sam Foley all featured at Stevenage and should play a part at Gresty Road, though Shay Facey remains doubtful and George Cox is a long-term absentee.